Where can I buy a trail tag? You can buy your trail tag at the National Parks Office on Oranje Bay. The office is open from 7am-5pm Monday to Friday. If you wish to purchase your trail tag outside of these hours they are available at Golden Rock Dive Centre, Scubaqua Dive Centre, Old Gin House Hotel, Golden Era Hotel, the St. Eustatius Tourism Office and online. How much does a trail tag cost? Can I have a guided hike? We offer guided hikes for a minimum of 4 people at a cost of $25 per person. You must book at least two days in advance. Why do I need to pay for a trail tag? All proceeds go towards trail maintenance within the national park, as well as any equipment required. 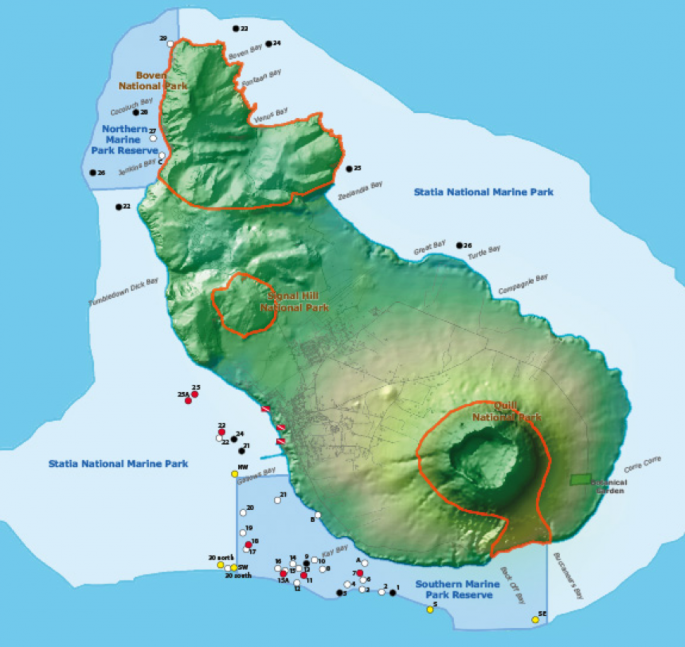 How long does it take to hike to the crater rim? It takes approximately 1.15 hours up and 45 minutes down on the Main Quill Trail. Please refer to our interactive map to see the route. How do I get to the start of the trail into Boven National Park? The beginning of the trail into Boven National Park is at the end of the road to Zeelandia Beach. You will see a sign showing the various trails in the national park. You can continue up the rocky path that you see ahead or walk 10m along the road you came and take the steep concrete road to your left. This will take you past a yellow house. You will see a chain that crosses the path. This is an alternative beginning to the trail. Where can I get a map of the trails? An extensive map of our parks can be found on the Our Parks segment of the website. You can also get a map at the National Parks office, Golden Rock Dive Centre, Scubaqua Dive Centre and the St. Eustatius Tourism Office. Can I camp in the National Parks? Yes, you are allowed to camp in the national parks but are prohibited from lighting open fires and littering. You can also camp in the Botanical Garden. Why do I need to pay to anchor in the marine park? Our Marine Park fee is an environmental fee that enables you to use our national park facilities. All proceeds go towards maintenance of the national park services. At the moment we are in the process of replacing the buoys. In the near future we have 10 brand-new moorings available for you. I have already paid a fee at customs, does that include my marine park fee? The fee that is paid at the customs office at the harbour is a warfarage fee, it does not include your marine park fee. Please continue to our office only a 3 minute walk from the harbour to pay your marine park fee. All proceeds go towards maintenance of the Marine Park. Can I moor or anchor in the Marine Park Reserves? No, we do not allow any vessel to anchor in the reserves. It is also prohibited to moor your yacht. This allows us to preserve the fragile coral reefs found in these areas. If you would like to snorkel or dive in the reserves you must be accompanied by a dive center. How can I contact you directly from my boat? Contact us on VHF 17/16 or the harbor on VHF 14. Where can I get wifi on St. Eustatius? How do I pay for my dive tag via the dive centres? Your dive tag is bought as part of your dive package with either of the dive centres on St. Eustatius. A single dive tag costs $6 whereas an annual dive tag costs $30. All proceeds go to maintenance of the Marine Park and the divesites. How many dive sites are there in the marine park? There are 36 dive sites in our Marine Park and Reserves. You must be supervised by a dive centre to dive or snorkel at any of our dive sites. How can I get in touch with the dive centres on St. Eustatius? There are two dive centres on St Eustatius. Can I wear gloves when diving? No, the rules and regulations of our marine park prohibits you from touching any marine life including coral whilst diving. This is also for your safety as some marine life can be harmful. Can I BBQ at the Botanical Garden? When is the Botanical Garden open? The Botanical Garden is open from sunrise to sunset. Please don’t be detered by the main gate being shut. We do this to keep roaming animals out. Can I camp at the Botanical Garden? Please let us know at least 3 days in advance if you would like to camp at the Botanical Garden. This way we can make sure that all our facilities are ready for you. What type of facilities do you have at the Botanical Garden? There is a large pavillion that offers shelter and shade. Next to this we have toilet and shower facilities. Throughout the garden there are areas to sit and picnic benches. How can I support STENAPA? You can make a donation on our donation page here or donate your time by becoming a volunteer.